The High Performance Planner is a 2-in-1 day planner and journal based on the world's largest study of how high performers increase productivity, set goals, prioritize projects, outperform their peers, and create the positive mindset and habits needed to win the day. Through morning mindset journal prompts, daily goal boxes, evening scorecards, weekly habit assessments, monthly project planning, and proprietary whole life balance sheets, the Planner helps you think more strategically, prioritize like a pro, achieve your goals faster, and become more focused, happy, and productive.Best of all, the Planner helps you install the personal and professional habits proven to lead to long-term success. That's what it's all about. Best-selling author Brendon Burchard says, High performance means succeeding over the long term without compromising your health or positive relationships. This Planner helps you do that by accounting for your entire life's progress, not just your daily to-dos.The High Performance Planner was created and field tested by Brendon Burchard, the world's leading high performance coach and a #1 New York Times best-selling author, whose books include The Motivation Manifesto, The Charge, and Life's Golden Ticket. 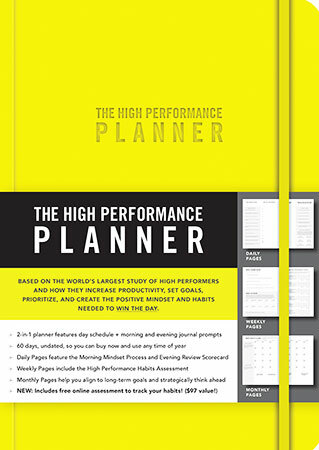 His pioneering research with the High Performance Institute led to Amazon's Top 3 Business & Leadership Book of 2017, High Performance Habits- How Extraordinary People Become That Way.The High Performance Planner is a 2-in-1 day planner and journal based on the world's largest study of how high performers increase productivity, set goals, prioritize projects, outperform their peers, and create the positive mindset and habits needed to win the day. Through morning mindset journal prompts, daily goal boxes, evening scorecards, weekly habit assessments, monthly project planning, and proprietary whole life balance sheets, the Planner helps you think more strategically, prioritize like a pro, achieve your goals faster, and become more focused, happy, and productive.Best of all, the Planner helps you install the personal and professional habits proven to lead to long-term success. That's what it's all about. Best-selling author Brendon Burchard says, High performance means succeeding over the long term without compromising your health or positive relationships. This Planner helps you do that by accounting for your entire life's progress, not just your daily to-dos.The High Performance Planner was created and field tested by Brendon Burchard, the world's leading high performance coach and a #1 New York Times best-selling author, whose books include The Motivation Manifesto, The Charge, and Life's Golden Ticket. His pioneering research with the High Performance Institute led to Amazon's Top 3 Business & Leadership Book of 2017, High Performance Habits- How Extraordinary People Become That Way.